You can use the head to make a series 3 shark based hero!!! why did you say series 3 you can say 3.0 instead a of series 3 and that is only for breakout but with 4 intead of 3.anyway cool set. Why dont you just bend the arms backwards so they appear as even MORE fins, and maybe even make it so its like a loch ness monster with four fins. he has hands so the hero can cuff him in this case furno can cuff jawblade. How does a shark escape jail? He's got rubbery blades?! Oh... God... why? LegoJang, summer prelims are out! 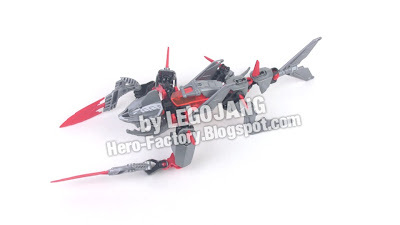 I wont give you the link, as you seemed disgusted about the winter prelims, but if you want to see them, go to Eurobricks hero factory 2012 topic. hey LegoJang I am new to MOCing could you give me some tips. Legojang, did you get all of your guys from Toys-R-Us? Because they're like, only in Toys-R-Us. dear legojang, iknow why jawblade has hands because how is furno going to cuff jawblade if he doesn't have hands right.